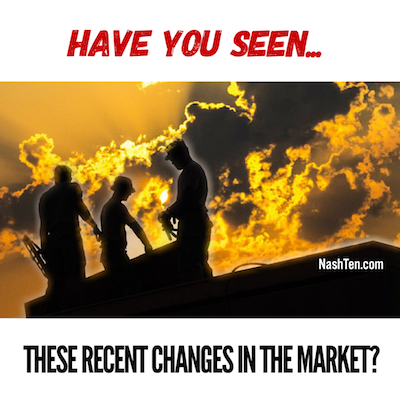 Have You Seen These Recent Changes In The Market? I was listening to an interview with Robert O’Neill, who was a member of SEAL Team Six who infamously took down public enemy #1, Osama Bin Laden, in 2011. He talked about his training and how important that it was for the success of that mission. While most of us consider the physical rigors the toughest part of the training, it’s the mind that the instructors are focusing on changing. One of the first things you learn in camp is the 40% rule. Your mind is ready to call it quits when your body hits 40% or your endurance, strength or pain tolerance. Even though your body is perfectly capable of blowing right by the 40% mark, your brain is telling you to stop now. And it’s nearly impossible to fight it. And I see a similar phenomenon with Real Estate. While buying a home is nowhere near as tough as the training these men go through, you see the drop out rate of buyers and sellers climb when real estate is tight. When the number of homes for sale were at record lows, many folks decided to sit this one out because they feared not being able to find the home of their dreams. While we’ve helped hundreds of people achieve success in every type of market, not everyone is ready for an adventure in real estate. So, I wanted to make sure that you knew about the recent changes in our market. While homes are still flying off the shelves and people still continue to move to Nashville in big numbers, the number of homes for sale are increasing. Much of it is due to homebuilders finally catching up to demand after more than five years on the sidelines. If the market forces put your plans on hold, I think it’s time to take another look while the rates are still low. Hit reply and let me know what you are looking for in your next home, and I’ll show you some properties that you did not know were available. Like this one right here. The Daily Deal in Nashville is this historic Cape Code located in popular Lockeland Springs [East Nashville] that is listed for less than $350,000.